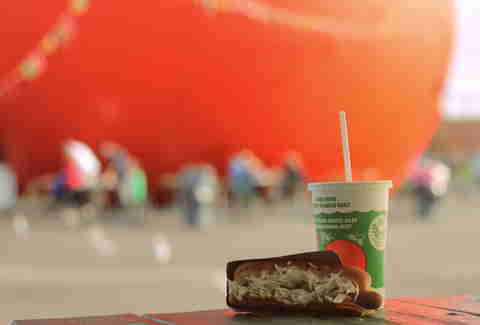 The hot dog, steamé, chien-chaud, weiner, meat-tube, frank, ballpark fuel, or whatever you want to call it has long been a staple on the Montreal late-night food scene, because, let’s face it, hotdogs are delicious, and stuff you eat late at night is even more delicious. Here are the finest places to get that tasty bunned fix in la Belle Ville. 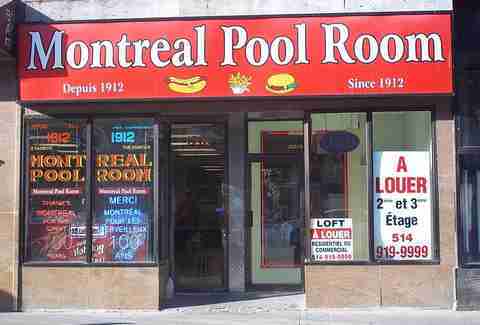 Rumored to be the birthplace of the all-dressed steamé, this ever-so-slightly-sketchy pool hall has been the greasy spoon hotbed of Montreal’s nightlife scene since 1912. In the ‘60s and ‘70s, it was where movers and shakers like Lenny Cohen or former Prime Minister Trudeau would go to get their dogs, greasy poutine, and that old chug-a-lug spruce beer. Now the clientele is mostly tourists, food bloggers, and local nighthawks, but there's a good reason for that, and it's because the steamés are still as delicious as ever. 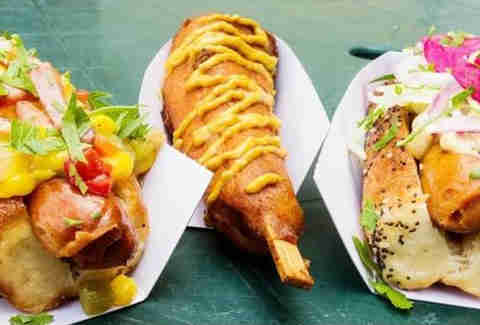 Since the lift on the food truck ban, the Chaud Dogs truck has been bringing the meat back to the street with their 100% housemade artisanal hotties. Their yellow truck may get you feeling all nostalgic, but their crossbred fusion dogs, like the hummus-adorned Hotdog Shawarma, or the omelet, kale, and carrot-topped Bibimbap Dog, are a far-cry from “traditional” and taste more like the ripe fruits of globalization in the 21st century… the point we're getting at is they're good. This is the place for steamé purists. Forget about all of those frivolous extras like “gourmet toppings” or “ketchup”. The no-frills, traditional owners behind this 50yr-old casse-croute (diner) would be downright insulted if you went so far as to put condiments on their dog. 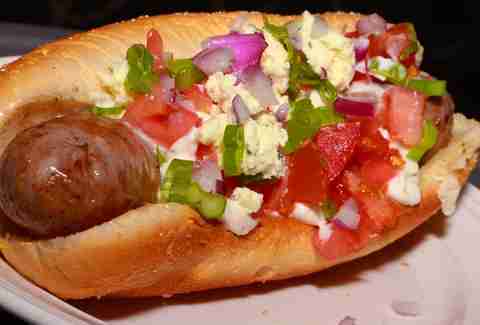 These guys stick to the basics, and they’ve got good enough ‘slaw on their franks to make it work. Okay, so where to start with this place. How about the fact that it's a giant, three-story orange? 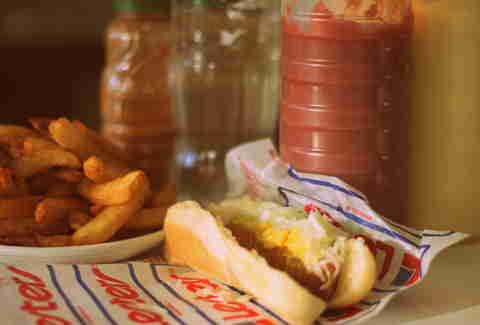 And that inside of that orange, you'll find one of the city's finest hot dogs (served with ‘slaw, onions, mustard, and relish) to be washed down with an orange julep poured from what looks like an old gas pump? Yeah, that's a good place to start... and finish. Go there. 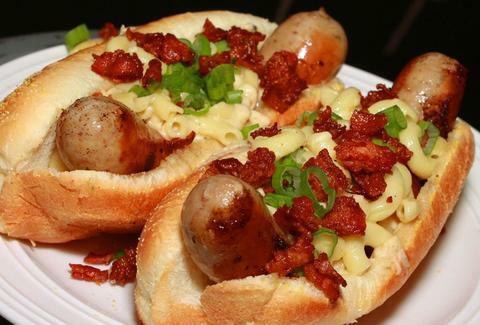 These gourmet haute-dogs are all celebrity-nicknamed, and deservingly so -- take for instance, the Morgan Freeman Dog: a pork, cheddar-jalapeño sausage, with grilled onions, mustard, pickles, and Memphis-style pulled pork, or the Nick Offerman (w/ bison sausage, steak, bacon & egg) and uh, Paula Dean, which forgoes butter in favor of being fried in blueberry pancake batter. We’d say that they’re Montreal’s best kept secret, but somehow, despite being at the end of the Orange metro line, they are always packed. We’d also say that they serve-up original, unattainable dogs, but they actually unabashedly serve store-bought Lester’s hot dogs on store-bought bread. It doesn’t make any sense, but their basic steamé, sprinkled with cayenne pepper and teamed with a side of fries is one of the best, most sought-after combos in the whole city of Montreal.